Epiphone, the world leader in archtop design, presents the Les Paul ES PRO™, a true ES-style archtop that combines Epiphone’s long tradition of building superior archtops with the classic sound and profile of the world’s #1 electric guitar, the Les Paul. Featuring an ES-body with f-holes and traditional electric archtop bracing, Epiphone ProBuckers™ with coil-tapping, a Dual-Action Truss Rod, Grover® Rotomatic machine heads, LockTone™ bridge, and Stopbar™ tailpiece. The Les Paul ES PRO archtop hollowbody features a Flame Maple Top and Maple Body with the classic Les Paul profile with carved f-holes inspired by legendary ES-style archtops like the Casino, Sheraton, and the “335.” The body top and back has single layer white binding along with a cream pickguard. The 24.75” scale neck has single layer Pure White binding and is made from Mahogany with a 1960s SlimTaperTM D-profile. The fingerboard has medium jumbo frets, a 12” radius, and “Trapeze” pearloid inlays found on 50s era Les Pauls. 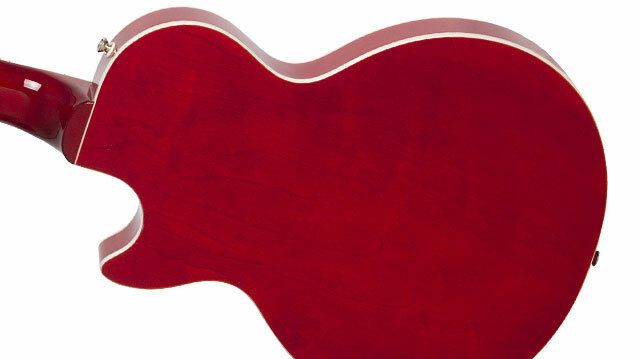 Inside the ES-PRO hollow body is a center block and counter brace, both hallmarks of a true ES-style archtop. The Les Paul ES-PRO is available in three beautiful color finishes, Faded Cherry Sunburst, Translucent Black, and Wine Red. Like many Epiphone Les Pauls, the new Les Paul ES-PRO is powered by Epiphone’s critically acclaimed ProBucker™ pickups, designed to recreate the first generation of hand wound Les Paul humbuckers from the 1950s that today can only be found in rare “Sunburst” Les Pauls that go for over $150,000 on the vintage market. Epiphone ProBucker humbucker pickups are made with the same 42 gauge Elektrisola wire as the originals, plus 18% Nickel Silver unit bases and covers, the same alloy used by Gibson for their BurstBucker™ pickups. The Les Paul ES-PRO features an Epiphone ProBucker-2™ in the neck position and a slightly “hotter” Epiphone ProBucker-3™ in the bridge position for leads. Both pickups also come with coil-tapping, activated by a simple push/pull of each pickup’s volume control, which allows players to mix single coil and humbucker tones together in endless combinations. 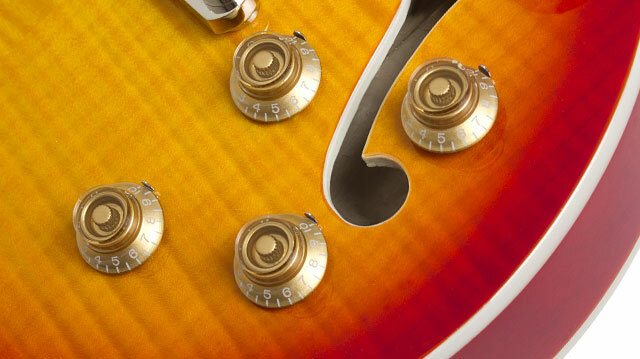 Each pickup has “Les Paul” style volume and tone controls with Gold RidgeTop™ "top hat" knobs with metal pointers. The 3-way Pickup Selector has a white toggle cap. The Les Paul ES-PRO’s archtop body design combined with its vintage-toned ProBucker™ pickups makes it one of today’s most versatile electric guitars. And, it’s available for the fraction of the cost of a vintage ES-style archtop or Les Paul! 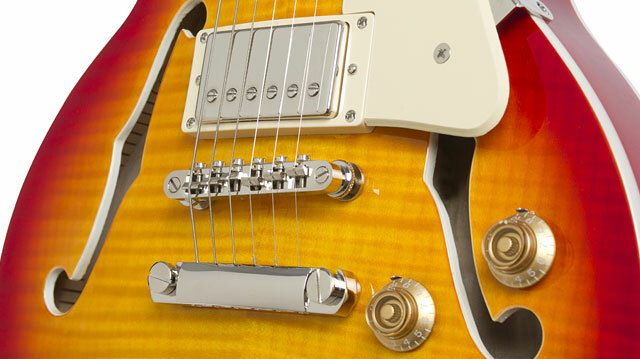 The Les Paul ES PRO comes with world class rock solid Epiphone hardware including a solid nickel fully adjustable LockToneTM bridge and StopbarTM tailpiece, an Epiphone all-nickel Heavy-Duty Non-Rotating 1/4" output jack with square jack plate, and legendary Grover® Rotomatics™ machine heads with an 18:1 turning ratio for fast and accurate tuning. 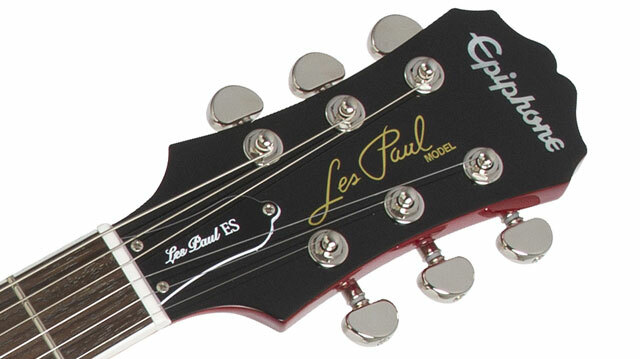 The Les Paul ES-PROTM comes with the Epiphone’s Limited Lifetime Guarantee and Gibson 365/24/7 Customer Service. An optional hardcase is available. Visit your favorite Authorized Epiphone Dealer or visit Epiphone.com to find an authorized dealer near you anywhere in the world and discover the new Epiphone Les Paul ES-PROTM today!